Also know as the "Rainbow"
CAM Raleigh is presenting the rainbow installation during the exhibition's opening preview reception the evening of Thursday, January 31, 2013 and the evening of Friday, February 1, 2013 during the museum's First Friday events. This installation creates a rainbow using a fine water mist and a powerful daylight film light. It is possible to see a conventional rainbow by standing almost underneath the water, but from the front you see a complex changing mix of colours. The title Everthing we are capable of seeing comes from the fact that white light, when split by a water droplet, breaks down into a broad spectrum of electromagnetic waves. Humans are only capable of seeing a tiny fraction of this, we can only see light ranging from blue at one end to red at the other. Different animals will see different rainbows depending on their eyes, dogs will see a much smaller rainbow, only the blues and greens, whereas some animals will see a much wider rainbow, from ultraviolet to infrared. The colours created in this installation represent the full limitations of our eyes and in that way encompass every hue that a human is capable of seeing. 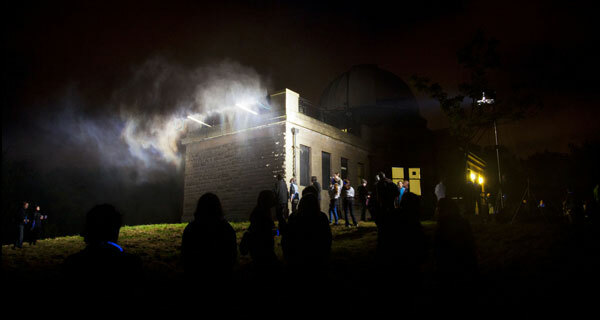 Having the opportunity to install the work at the Mills Observatory in Dundee was especially relevant to this work. This old telescope allows us to see stars in the visible range of the spectrum, although the telescope enables us to see space with more clarity recent advances with different wavelengths such as infrared and radio waves have enabled us to see far more than what is capable with the narrow range our eyes allow.